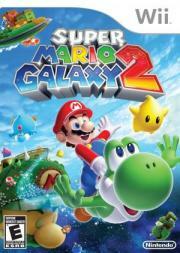 I’m not entirely sure why every video game critic in the universe went totally bonkers over Galaxy 2. Yes, it’s still mind-bending fun. Yes, the addition of Yoshi is a breath of fresh air. But it’s still, for the most part, more of the same. It’s a good thing the first Mario Galaxy was so unbelievably fantastic, as more of the same of that can’t be anything necessarily bad. Top 5 material for sure. Probably better that the original. Mario Galaxy but more? I ain't complainin'. Improves upon the last game significantly, which was already a fantastic title. It adds new content such as yoshi, a better hub world, better challenges, some (admittedly tacked on) replayability. This game will stand the test of time as one of the best Mario titles ever released, much like its predecessors had. I'm still dangling by the Wii nunchuk cable trying to get something out of it. Absolutely my favorite 3D Mario. I've always preferred the linear obstacle course style over exploration, in this series. This isn't as unique as the first Galaxy was but it tightens things up and is more fun. The game that the first Super Mario Galaxy should've been, and example of a sequel that improved upon it's predecessor in every way. It got rid of the confusing hubworld and replaced with an easy-to-navigate world-map, it fixed the balance and difficulty of the boss fights, it introduced more variety in play through more power-ups and more creative level design, and if that wasn't enough it gave us more Yoshi!